Automatic loading of preferences from the DWG file. (When opening a DWG file, the relevant preference file automatically loads up. It includes the latest modifications). 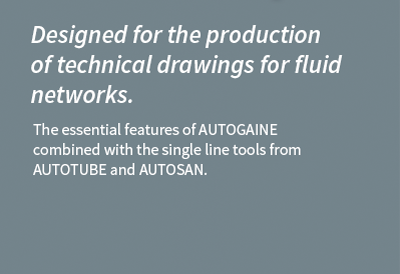 By specialty, by geographical location and by single-line or double-line drawing mode (very flexible). By type of graphic entity (network, materials...). Several types of layer combinations (time saving). Texts, dimensions, arrows, conduits intersections. A range of hatching styles to symbolise coverings (thermo isolation, flocking). Conversion of rectangular/circular sections, coefficient of roughness of materials. Flow units, pressure drops units. Option for renaming layers for intelligent sorting. Management of the unit system (Metric/Imperial). Detailed drawings of all the accessories according to their configuration. Insertion of standard components in line on existing duct drawings. Point to point air duct routing in single-line or double-line mode. Customization of air conditioning terminals (fan coil, cassette, air handling unit...). Drawing of grids and registers. Automatic adjustment of grids and diffusers onto suspended ceilings. Registers library to draft grids and plenums. Automatic drawing of register connections onto main sewer pipes. Detailed drawing of flexible conduits with customizable curve radius. Point to point hydraulic and sanitary pipework routing in single line mode. Five specifications specially developed for steel, copper and PVC pipework. Point to point single-line routing of a set of pipes (up to 6 pipes). Point to point routing of hydro-cable networks. Cross-sectional drawing and computation of the distance between the centres within the set of pipes. Automatic insertion of the list of conduits constituting a set of pipes. Drawings of the different types of heaters (panel-type radiators, multiple elements radiators...). Symbolic or realistic representation of the heaters. Library of customizable kitchen and bathroom facilities. Changing an object (turning an elbow into a slope, changing the ND of an already drawn duct, changing a topside connection into an underside connection...). Moving an object (when drawing a reduction the conduits adjust and adjacent elbows follow automatically...). Deleting an object (the conduit 'closes' automatically on deleting a connection...). Show crossed networks in double-line or single-line (by hiding or ‘cutting’ with an offset of one duct in relation to another, with only 2 mouse clicks). Automatic rebuild of sectioned conduits. Manipulation of layers (freeze, transfer, lock, etc...). Dimensioning settings (unit, number of decimals, arrows, etc...). Simpler dimensioning operations than with AutoCAD. Automatic update of dimensions on changing the settings. Type of lines with inserted letter. Automatic update of the number of lines. 'Click to text' function: when clicking onto a network, some related data automatically pre-populate the text field (such as the air duct portion). Automatic insertion of prefixes and suffixes in the texts. Automatic section formatting according to the material specifications. Automatic insertion of leader lines, frames, arrows, points, etc. Automatic adjustment of the leader line and frame when the text is modified. Choice of the character font and of its size. Definition of plan zones for the network and material bills creation. Immediate and automatic extraction of conduits and material quantities within the predefined zones. Immediate and automatic extraction of equipment quantities within the predefined zones. Material bills exportation to AUTOCAD or EXCEL. Automatic insertion and management of assigned blocks. Automatic drawing page layout with creation of presentations. Automatic insertion of formats and title blocks. Calculate the scales and update the scale of views. Automatic insertion in the margin of the file name, of its path and of its associated XREF. Computation of a duct section according to the flow (or power and Delta T), in relation with speed constraints or pressure drops limitations. Computation of the coefficient of friction (j) of a duct section. Computation of a network size according to its representation. Computation of levels while routing on change of duct portion. Quick computation of added sanitary supply base flows. Computation of levels in drain networks which are already drafted. 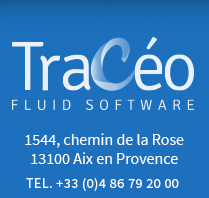 AUTOFLUID 10 is a Tracéocad product. ©2014 Tracéocad all rights reserved.Legals.